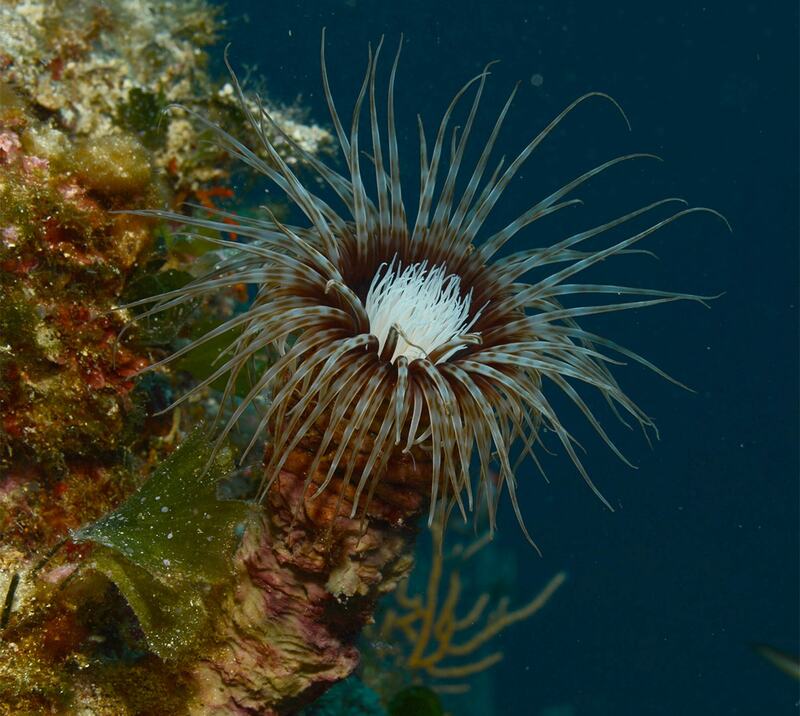 Characteristics: severe exposure to sea waves, intertidal zone and intense sunlight zone represent extreme life conditions where only the most resistant life forms can survive. 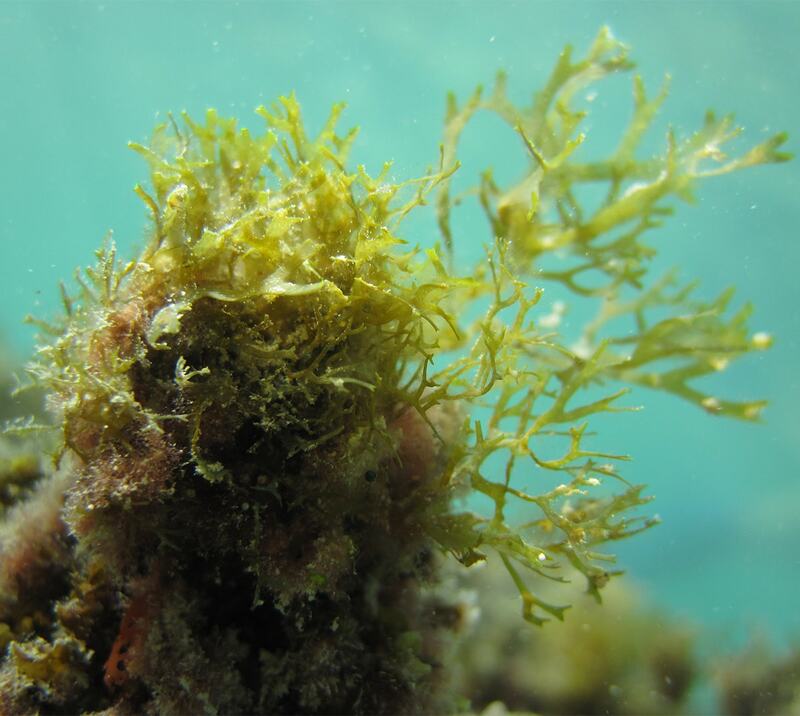 Habitat: Biocenosis of infralittoral algae, appearance of marine flowering plants on the steps of vertical cliffs. 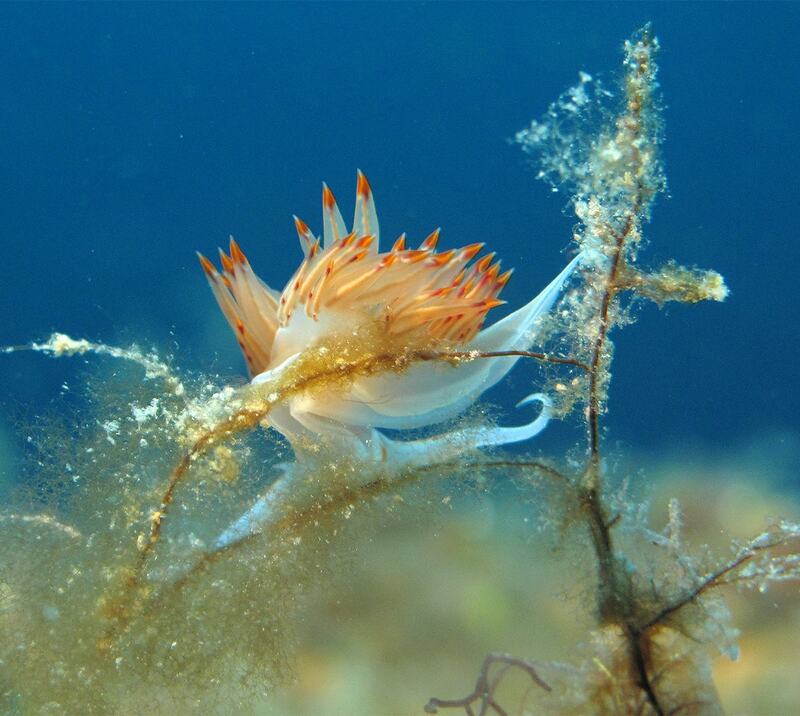 On the “steps” of vertical cliffs: Biocenosis of the marine flowering plant Posidonia oceanica near which it is possible to find the long-snouted seahorse (Hippocampus ramulosus). 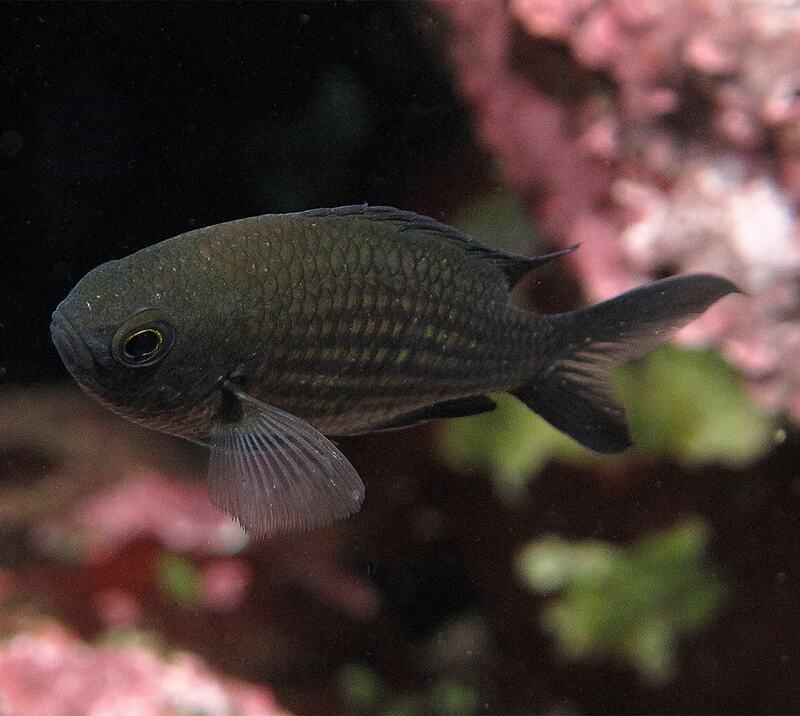 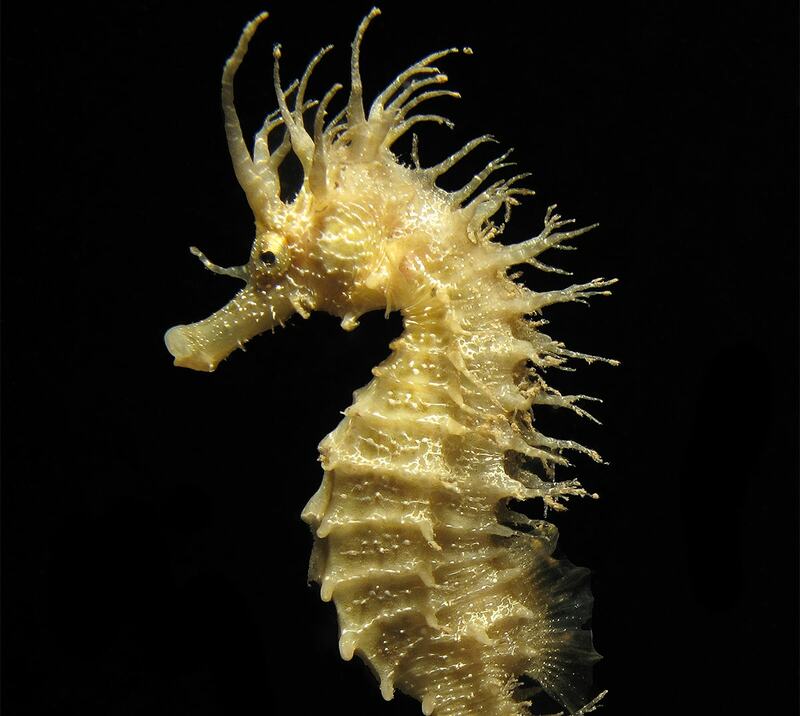 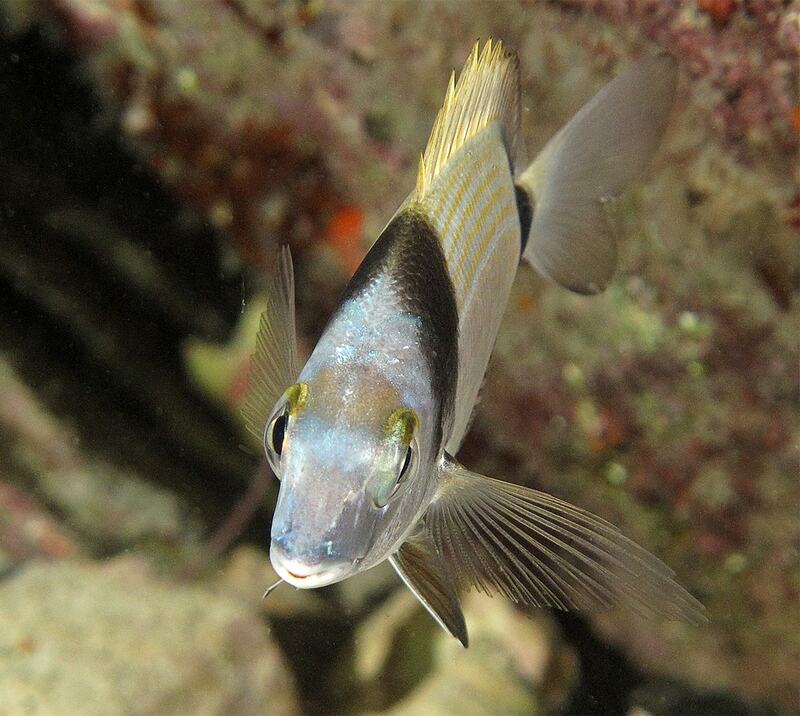 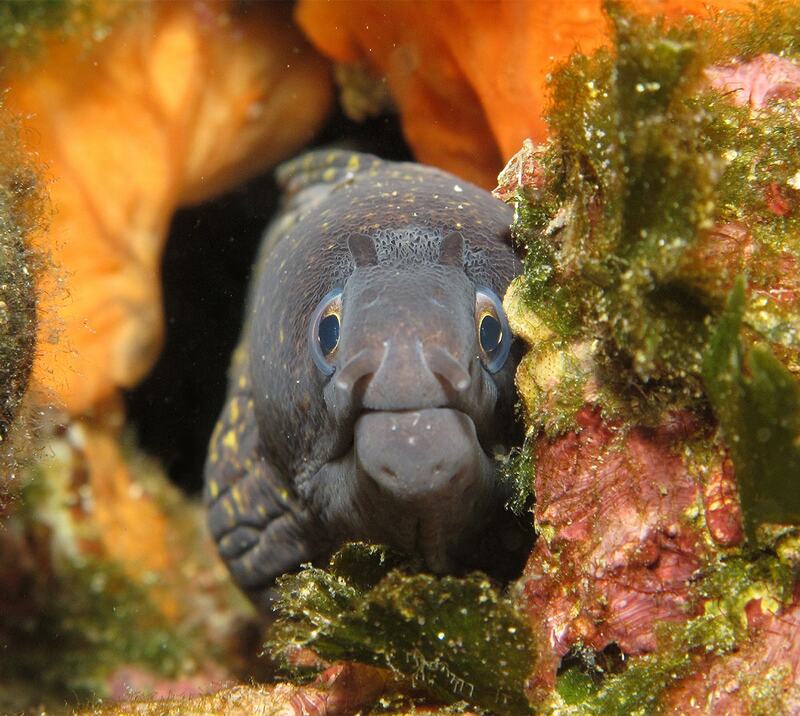 Characteristics: lesser exposure to sea waves and the intense sunlight zone represent better conditions for the development of light-loving species. 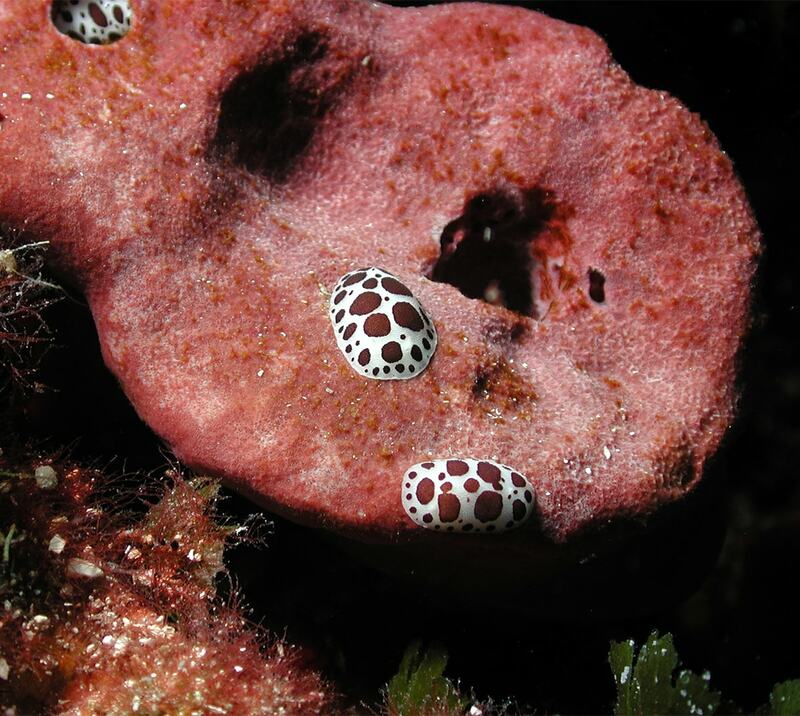 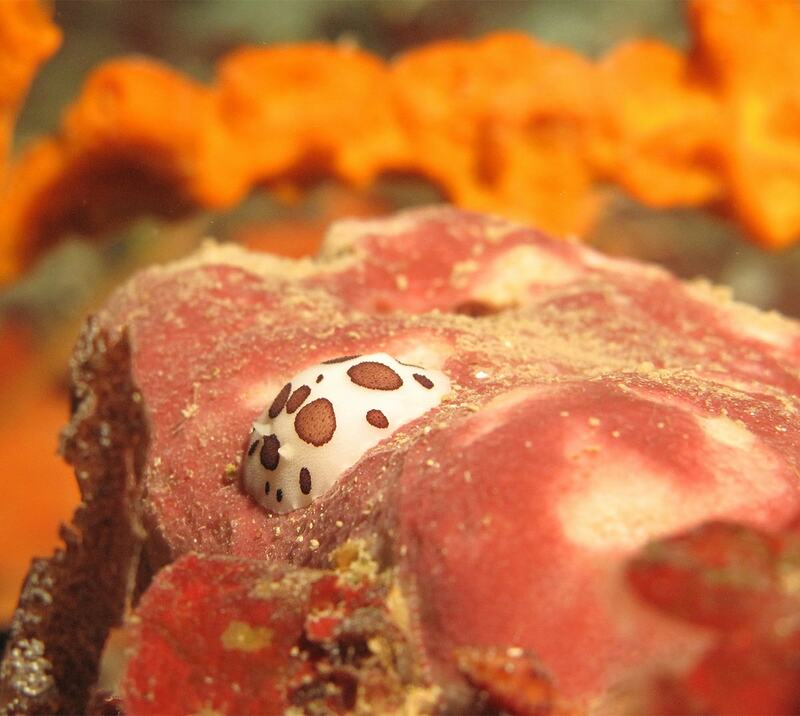 Common species: Dalmatian Chromodoris Nudibranch (Discodoris atromaculata), the Mediterranean moray (Muraena helena) appears in cliff cracks at these depths. 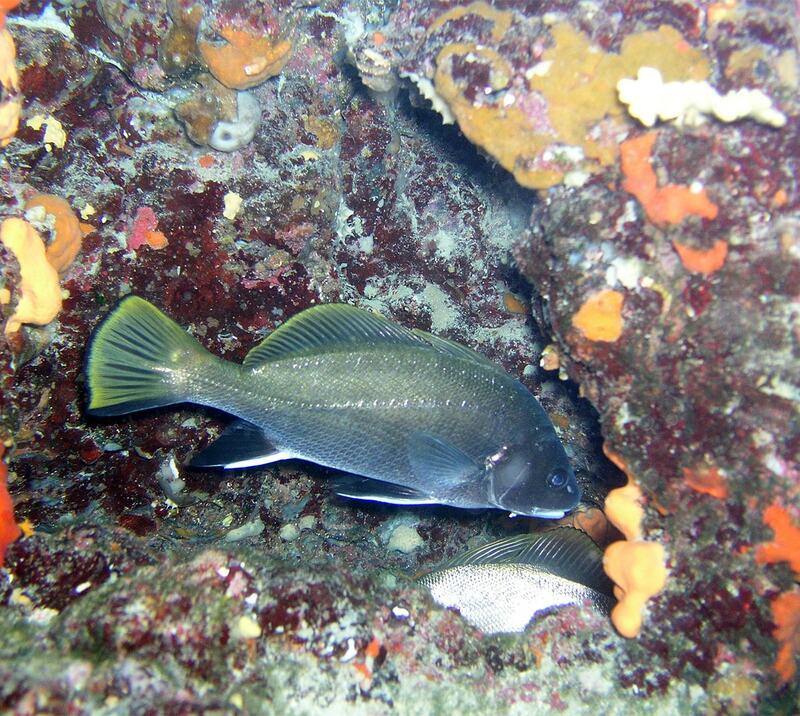 The brown meagre (Sciena umbra) is also connected to cliff cracks. 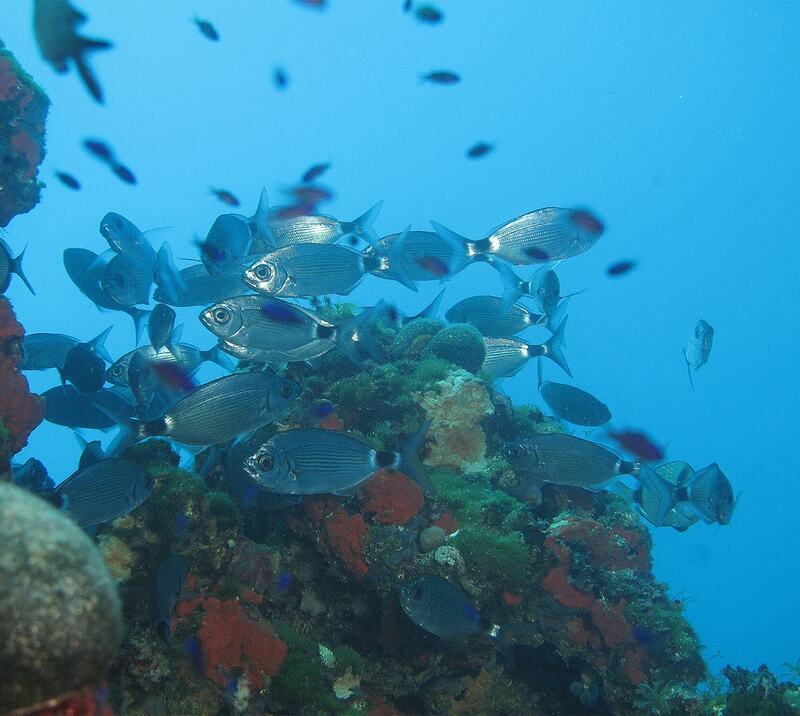 Shoals of fishes such as the saddled seabream can be seen here. 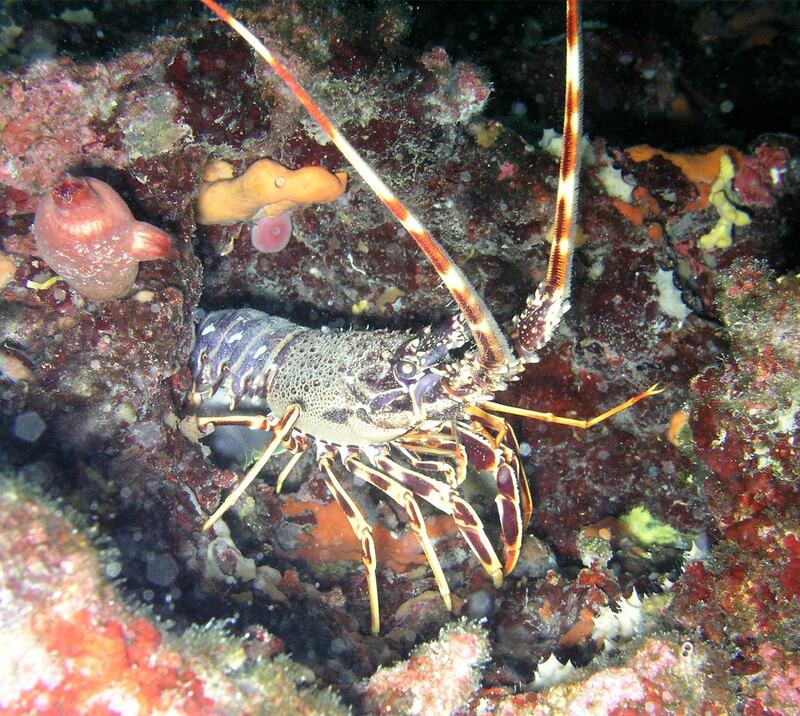 Characteristics: two habitat types alternate at these depths. 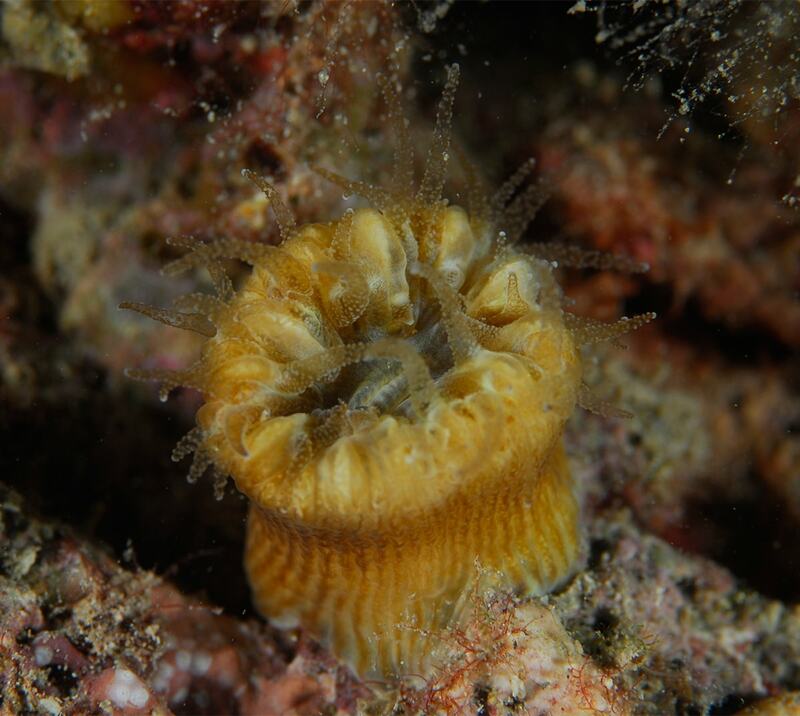 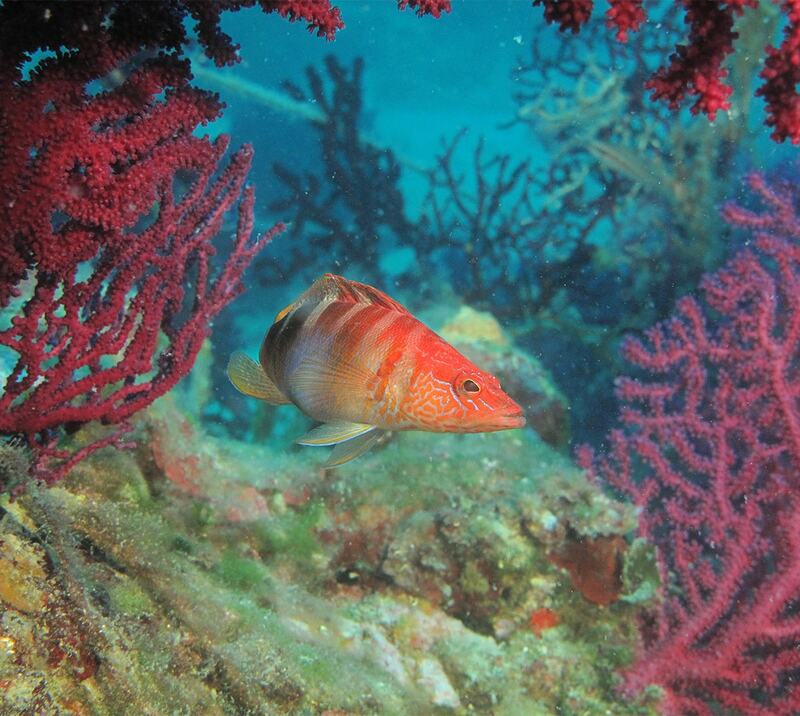 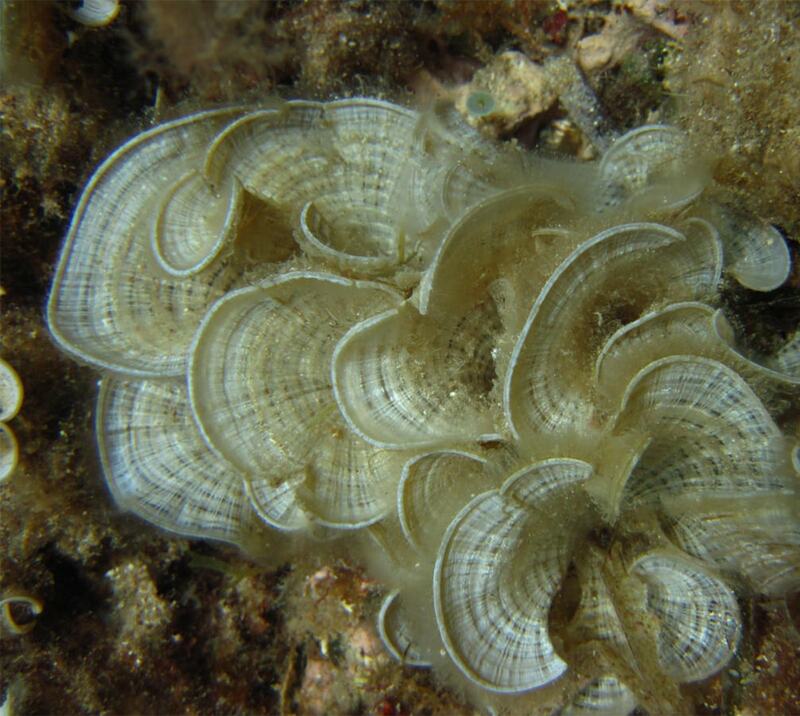 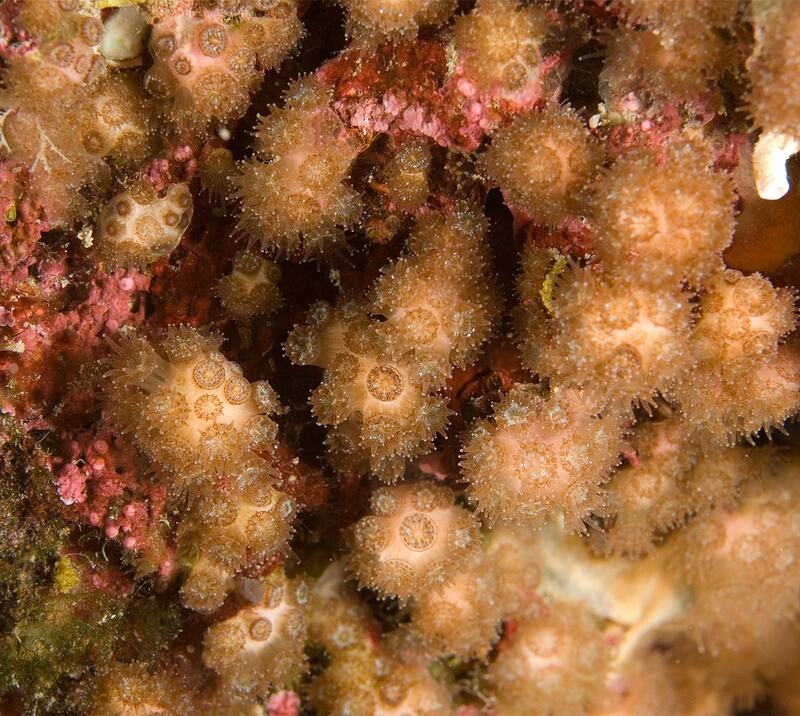 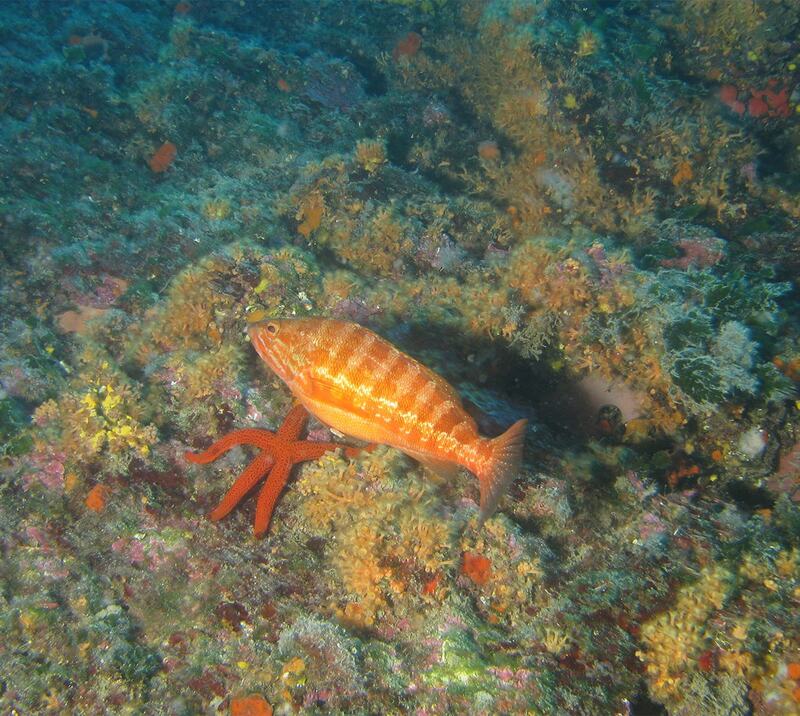 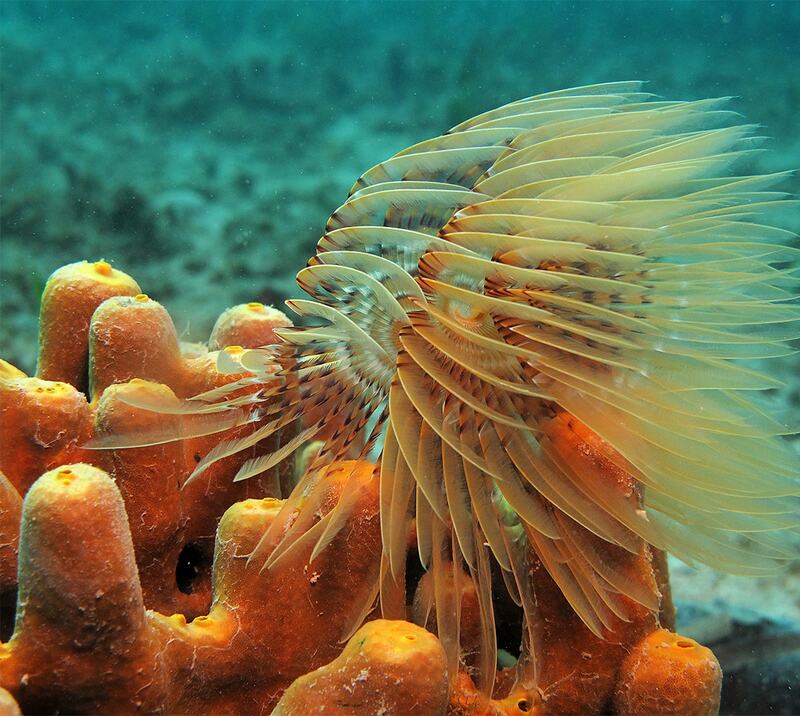 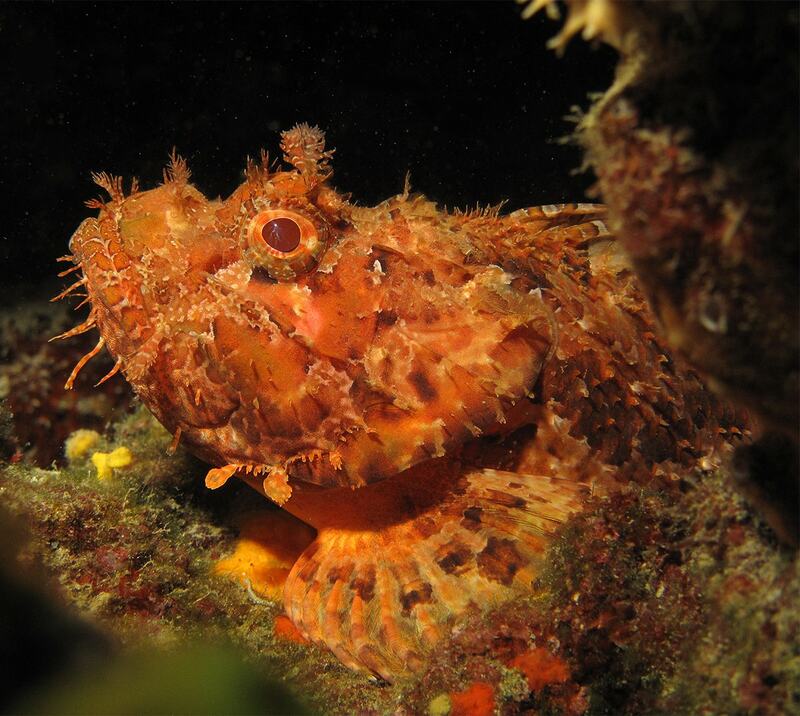 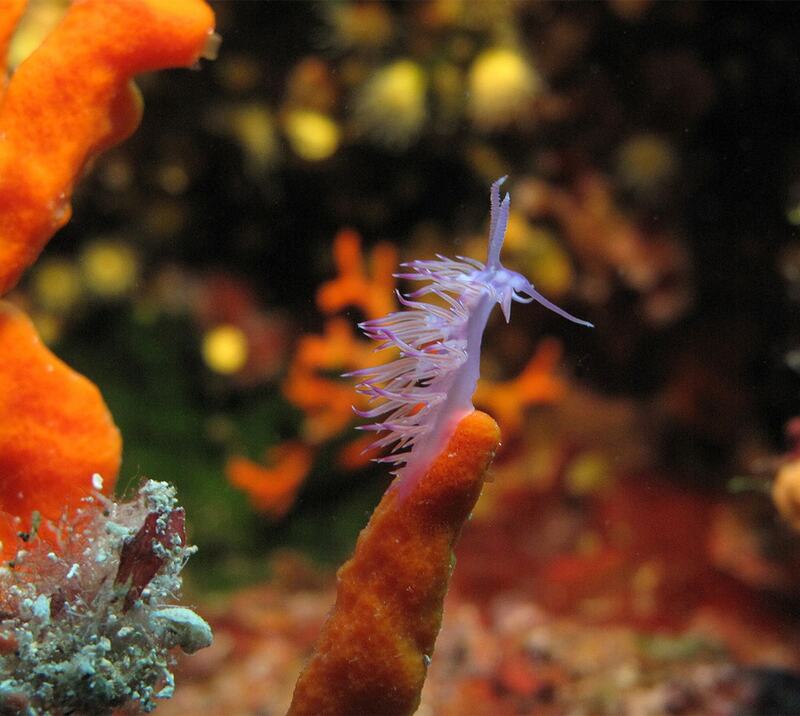 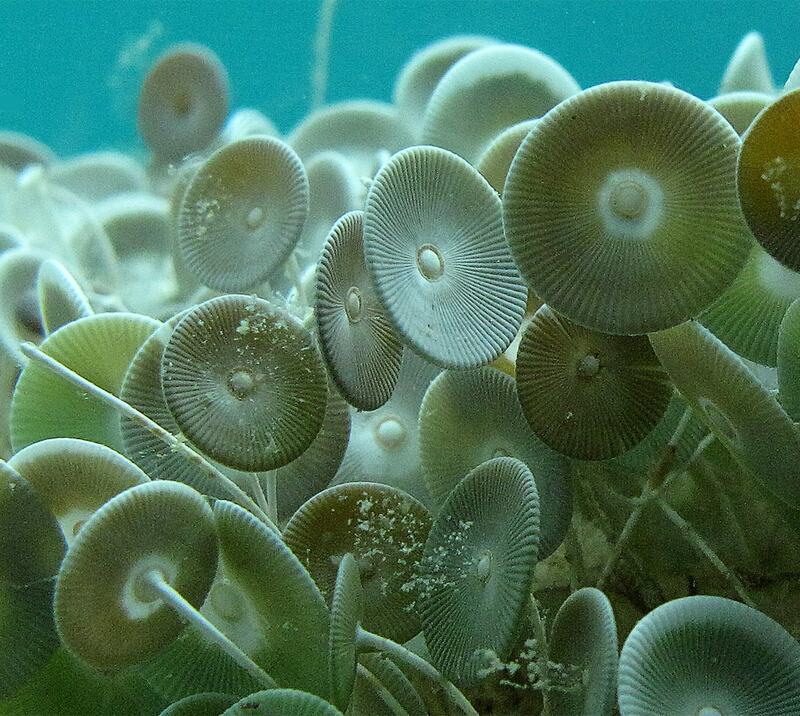 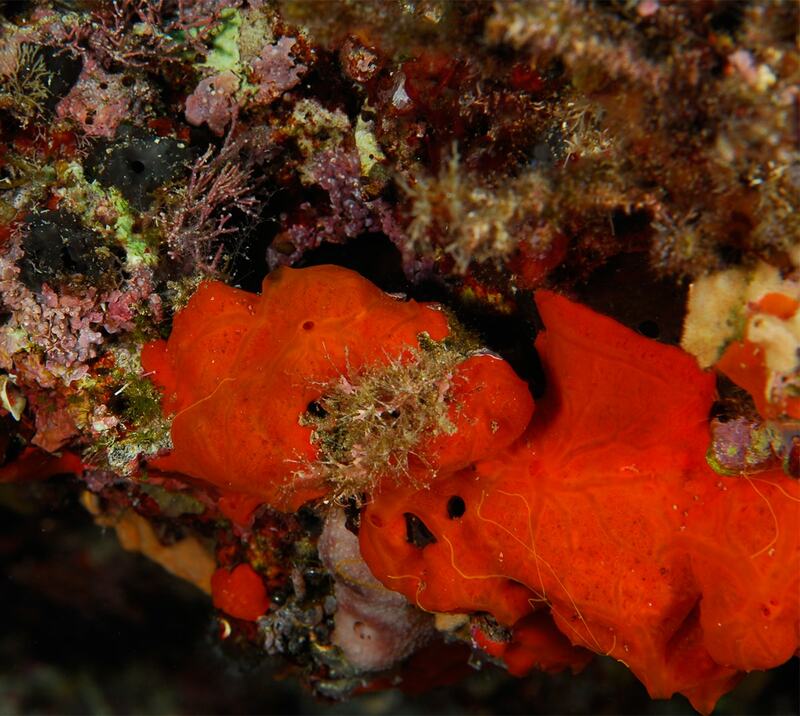 The species that love intense sunlight disappear with depth, and coralligenous biocenoses species appear. 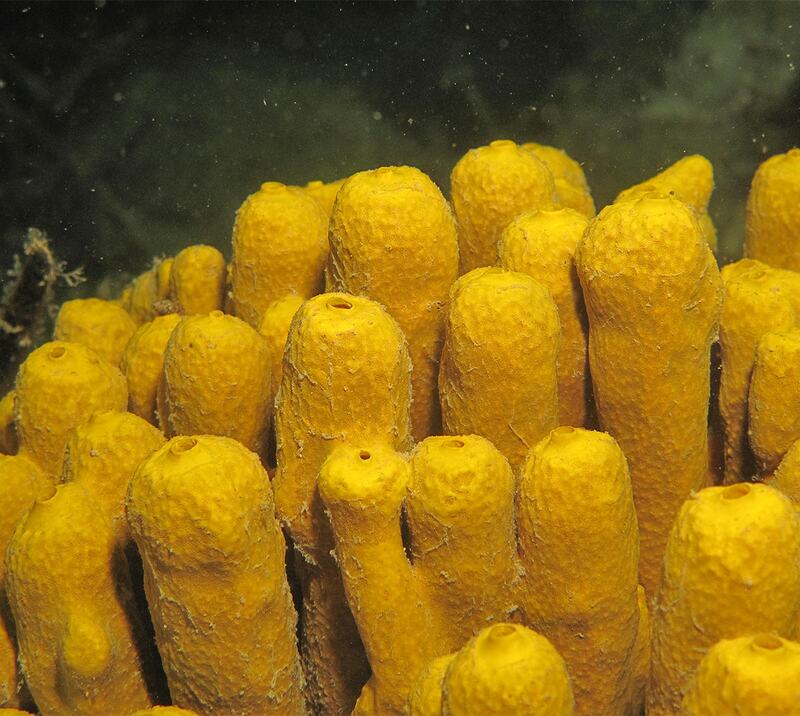 Sponges: Hexadella racovitzai, Scalarispongia scalaris, Chondrilla nucula, Hemimycale columella, Spongia agaricina, Spirastrella cunctatrix, Petrosia ficiformis and Sarcotragus foetidus. 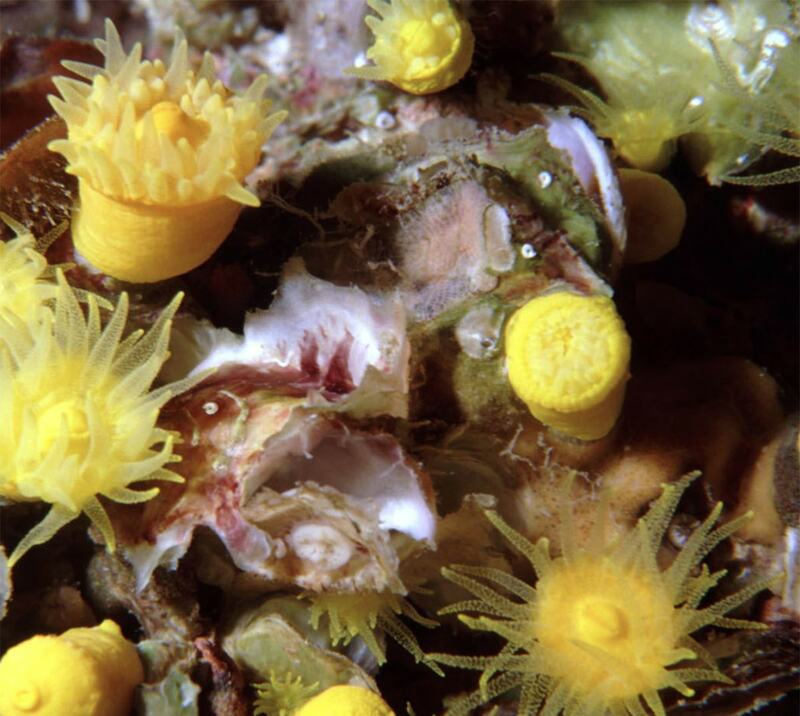 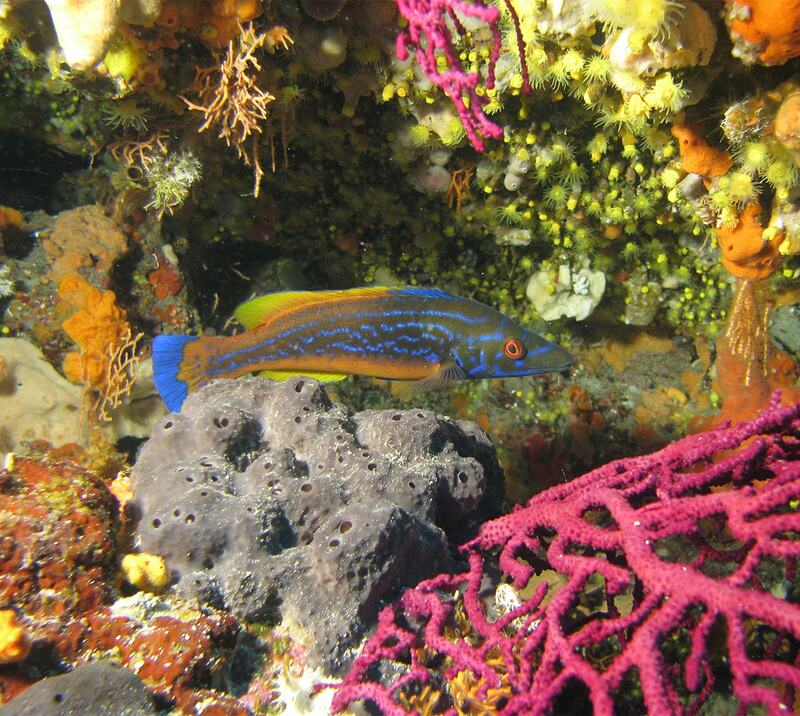 Characteristics: coralligenous biocenosis is a habitat of great biological diversity where many species find their refuge; mostly corals, sponges, coralline algae and moss animals. 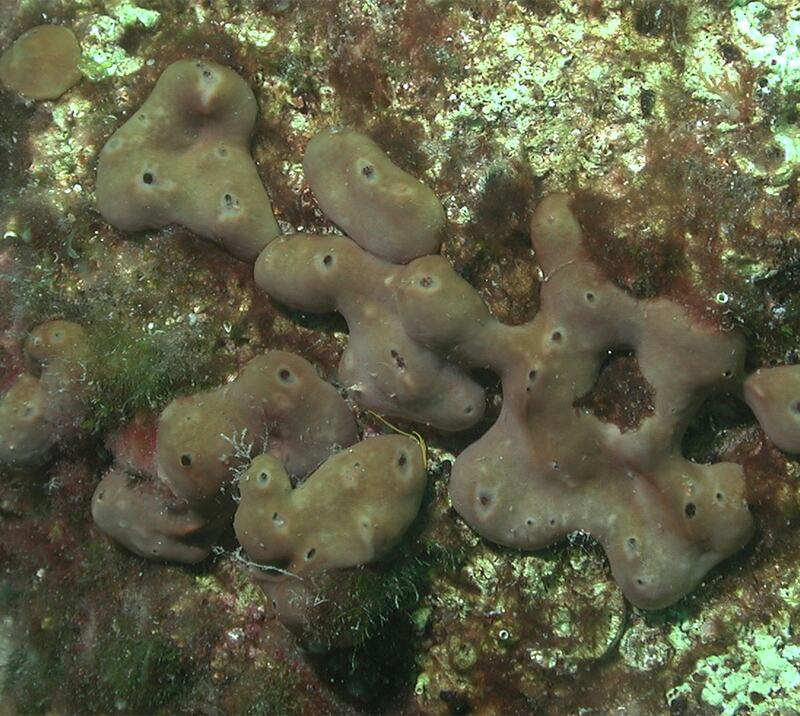 Cracks of various sizes also appear on the cliffs, which are inhabited by the species of semi-dark caves biocenosis. 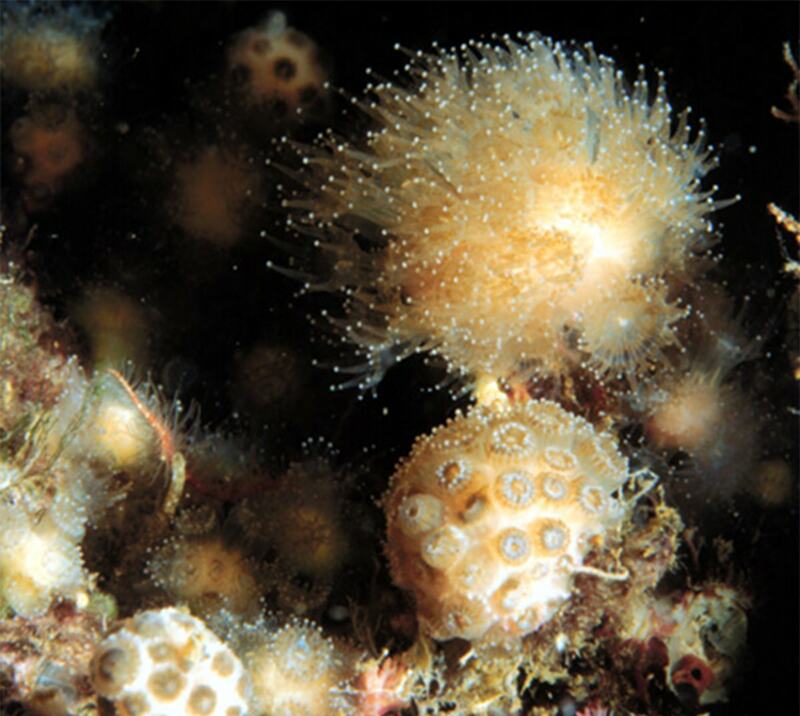 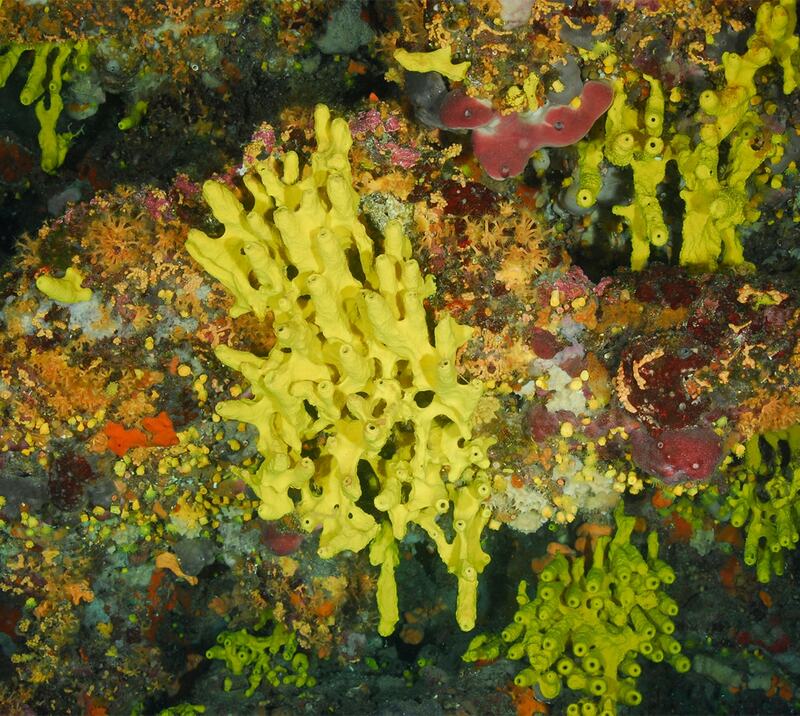 Species of semi-dark caves: Stony corals (Hoplangia durothrix, Leptopsammiapruvoti and Madracis pharensis), sponges (Aplysina cavernicola) and moss animals. 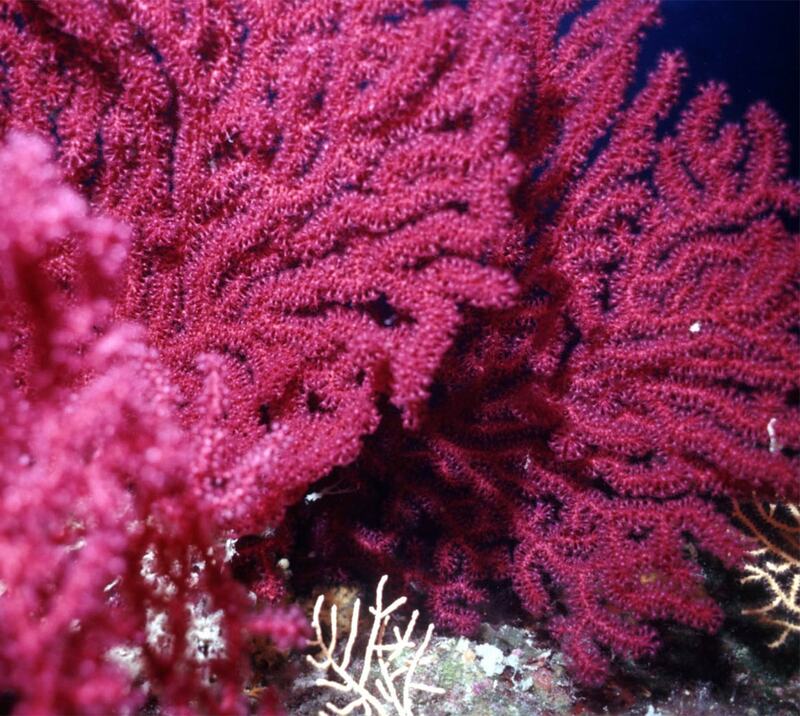 Characteristics: if we go deeper the species slowly alternate and red gorgonians take their place in the colour spectra from yellow to deep purple. 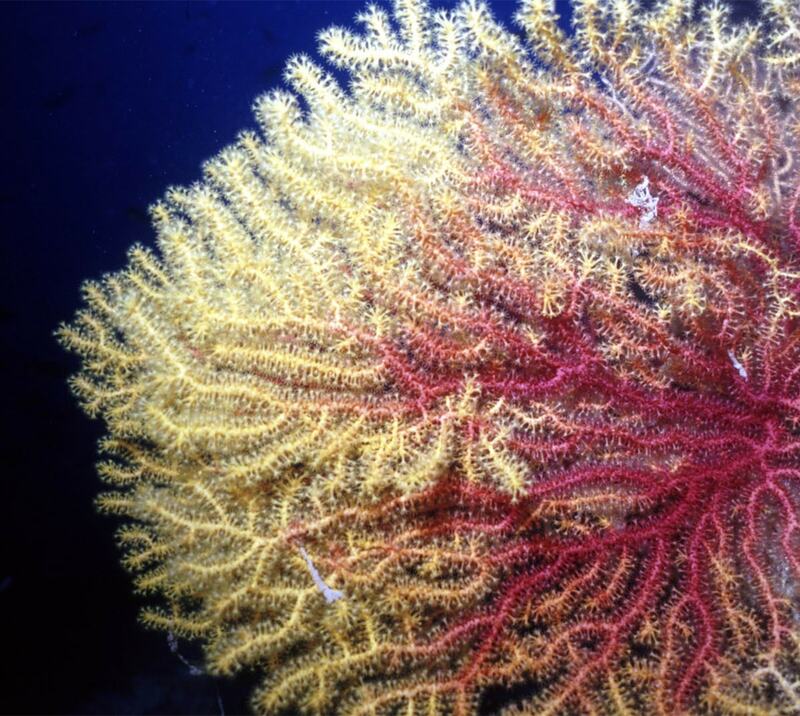 Red gorgonians prefer deeper seas where the currents are strong. 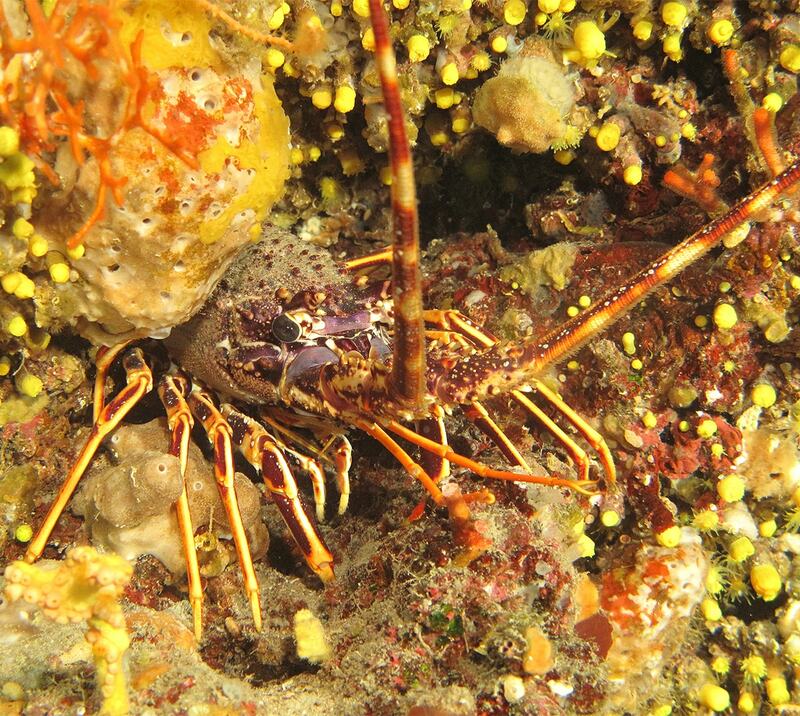 Crustaceans: spiny lobster (Palinurus elephas) - in stone cracks on vertical cliffs. 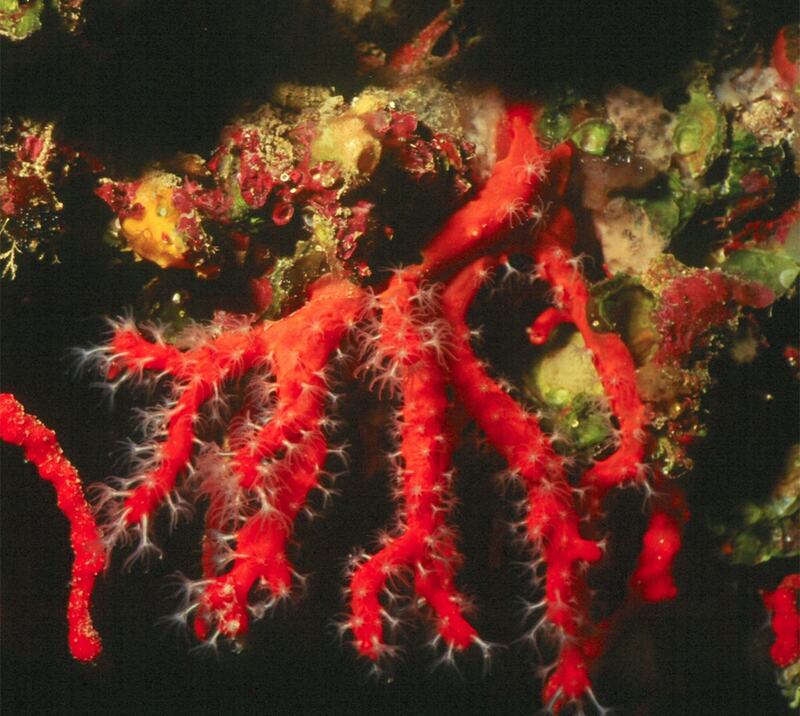 Characteristics: vertical rocky bed is an ideal place for the red coral which prefers dark habitats without the sediment. 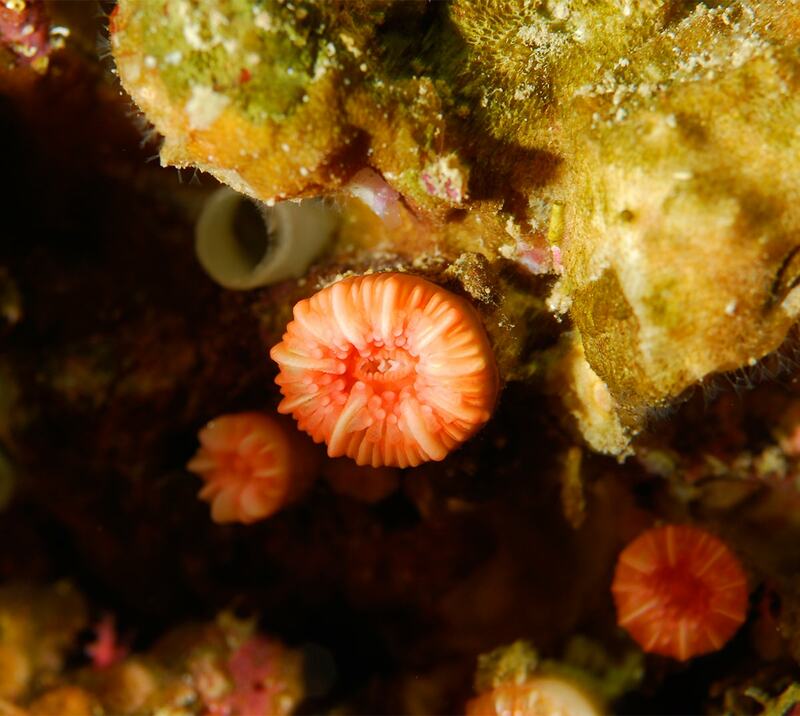 Appearance of species: the red coral (Corallium rubrum) on vertical rock. 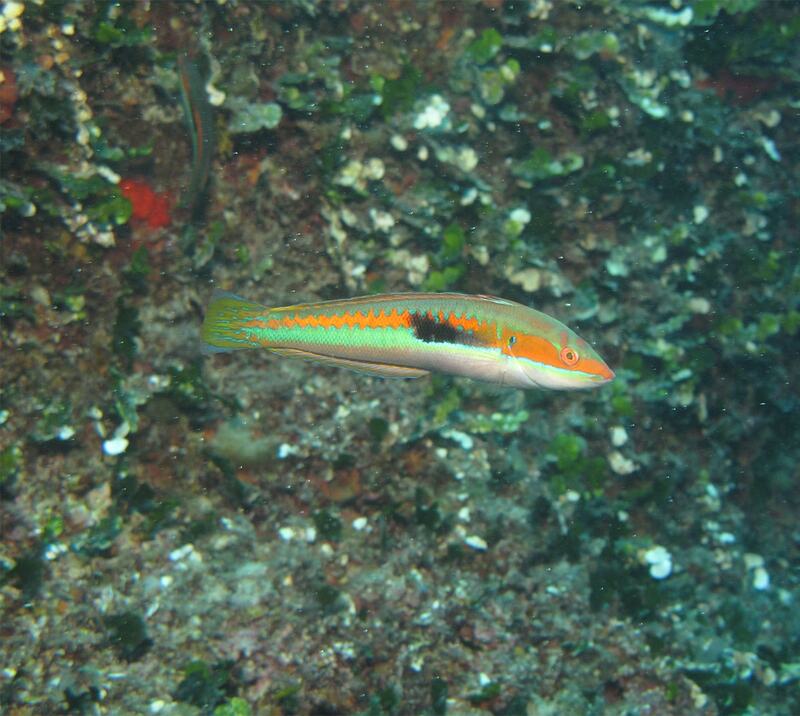 Fishes: Comber (Serranus cabrilla) and Cuckoo wrasse (Labrus bimaculatus) – inhabits the steps on sandy – shell sea bottoms (with no red coral). 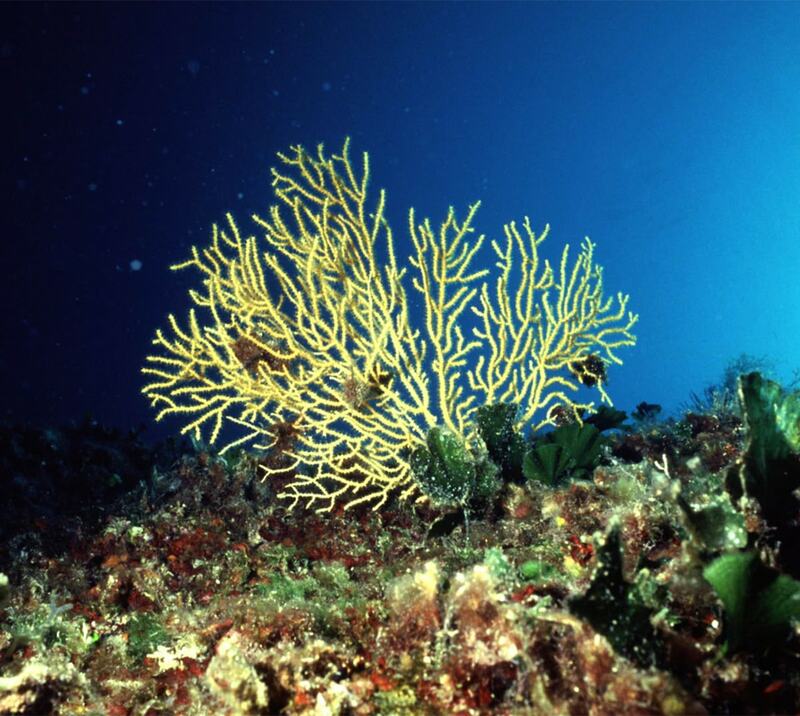 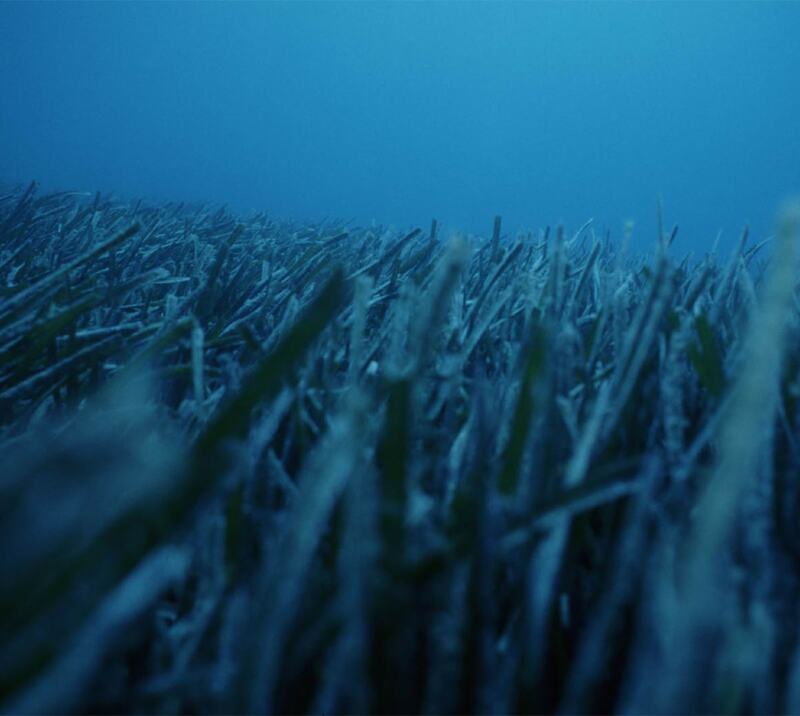 Habitat: Coralligenous biocenosis, beginning of detritus sea bottom biocenosis. 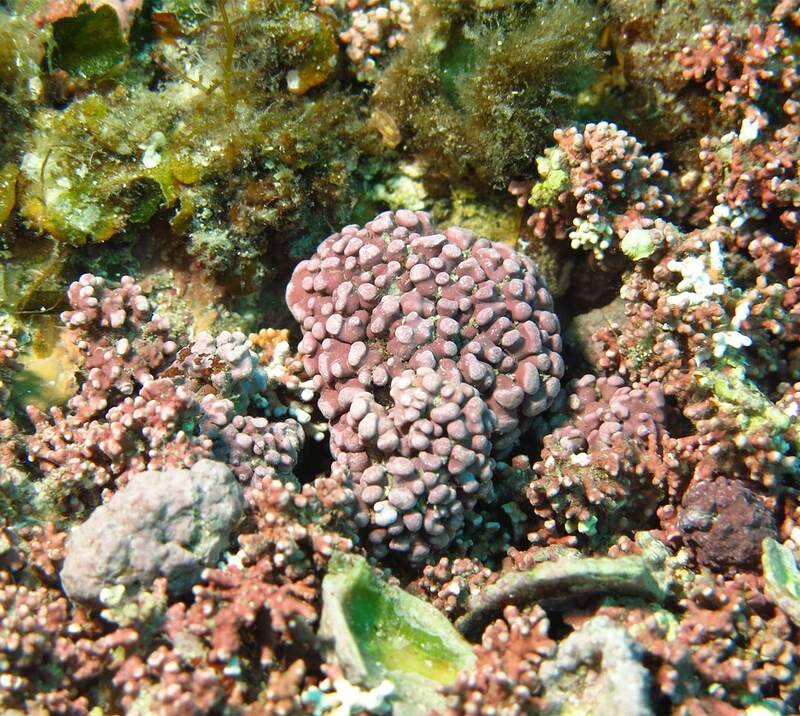 Species: Red algae Vidalia volubilis and Lithophyllum racemus, anemone Cerianthus membranaceus (still tied to rocks).